Admit it, when was the last time you ate Brussels sprouts? I was indulged in these beautiful cabbage buds (to me!) one year back when I saw at some one's blog and thought of giving it a try. Though I was skeptical initially, but started to cook with Brussels sprouts quiet often and now it has become one of our family favorites. JB loves having Brussels sprouts with chapatis, rotis or rice and dal. Brussels sprouts can be cooked in many ways. Some like to eat it raw, some boil it, some roast it, some stir fry it while some bake it. There are many yummy recipes available in the food blogosphere! 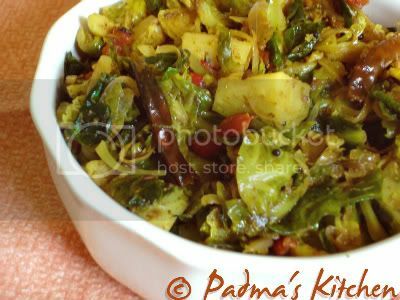 But only one basic formula: Treat this veggie as you do with cabbage and it will justify its presence in the dish you make with it. Many people like to have it when the Brussels sprouts are well cooked. Check this article on San Francisco Chronicle I bet you will go back to this veggie again and again! I am making Brussels sprouts stir fry with the spice mix I blogged last week. Now sit back and enjoy the show....oops recipe! Clean the brussels sprouts, remove any loose leaves and chop them into bite size. Heat oil in a large sauté pan, add all the ingredients under tempering list and fry for a minute. Turn heat to medium high, add diced shallots, hit some salt and this will sweat the shallots. Add roughly chopped roasted red pepper and diced brussels sprouts. Sauté on high for about 10 minutes, if required sprinkle some water and cook it till done. Lastly add the peanut garlic spice mix and cook for another two minute until it is mixed well. Serve with rotis or rice. 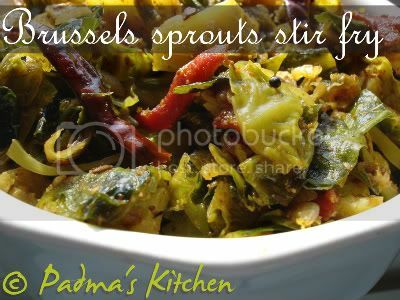 I should try this recipe..sounds interesting..
Wow, you have made brussels sprouts look so good! Your recipe has me convinced that I need to start cooking with brussels sprouts more often :). I'd like to feature it on our blog, please let me know if you're interested! I love Brussels sprouts but I tend to cook them simply. I halve them and place in a non stick plan with with a nob of butter and a big pinch of cumin seeds and cook over a low heat with a lid on. I stir occasionally. The idea is to char the sprouts slightly. A squeeze of lemon is all that is needed. I like them with still some texture . This is simple to do but really tasty with dal and rice. In England Brussels sprouts are traditionally boiled to death and eaten with a Christmas roast. I am vegetarian and much prefer them in an Indian meal! Through My lens ~ Guess!